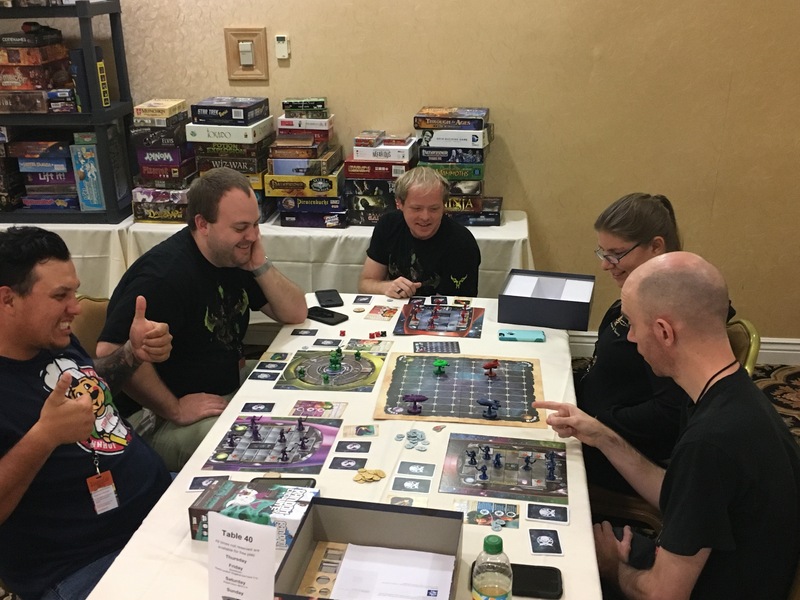 Over the weekend, Rayguns and Rocketships got its first official in-person reveal at Kingdom-Con 2017 in San Diego, CA. Featured here is a cinematic 4-player Deathmatch battle. It was incredible. Each rocketship started at a home planet, and once the gunshot rang out, they raced to their engines, rocketed for the stars, and beat the snot out of each other. Initially, the Zard anticipated the Space Pirates blasting off into the center of the map due to watching the Space Pirate player deploying two ship crew to the engines. As such, the Zard decided to operate around the edge of the board, and the Space Pirates, incidentally decided to race directly for the Zard. What came of that? A catastrophic mid-flight collision that rocked both ships to the very core, doing substantial damage to their engines, rendering them nearly immobile. After the collision, with neither ship being able to properly fire, the Space Pirates decided to invade the Zard ship. 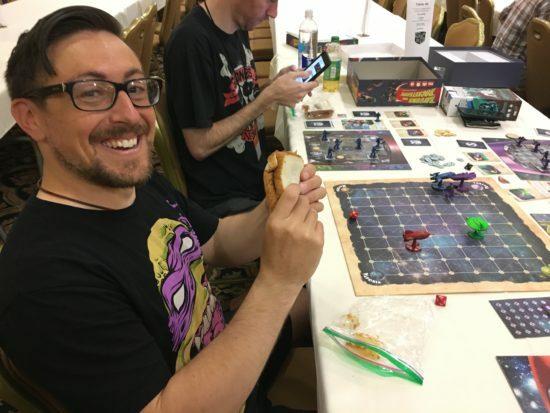 In the ensuing battle, Fanglaird Varanus, the Zard captain, fell in combat as he watched the remainder of his crew succumb to the superior Space Pirate boarding party. The deadly Space Pirate boarding party! Meanwhile the Blaarg Saucer zipped across the map, engaging in a short fire-fight with the aptly-navigated Astro Ranger ship. 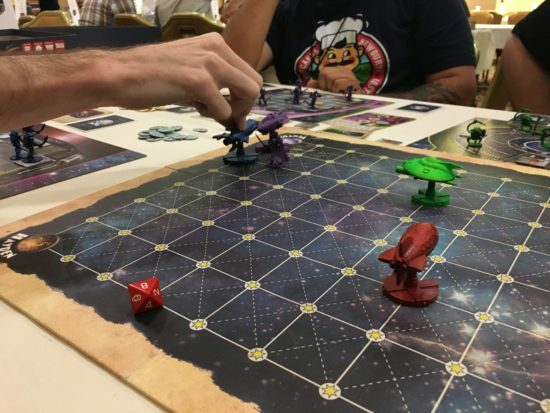 As a good Astro-Ranger captain, the player in control of Jesse Novastar guided his ship like an expert, traveling just outside of range, flanking the saucer and firing as it passed. Very quickly, the Astro-Ranger player racked up a comfortable lead with his clever and strategic pilot skills. But the fight got even more heated. Smelling blood, the saucer began to engage the collided Zard and Space Pirate ships, taking advantage of their weakened states and poor star map presence. After a blistering shot from the saucer’s special Beamer Ray, the Blaarg had caught up and tied the Astro-Rangers. I desperately needed a sandwich! The Astro-Rangers began to run away. Everyone at the table could not believe it. Thinking it had the advantage the Blaarg player took pursuit. The saucer was beginning to turn around and engage the fleeing Astro-Ranger ship, when the Astro-Rangers moved their crew to man the starboard rayguns and fired their special ‘retro-rockets’ and moved backwards, perfectly opening them for a complete broadside attack from their starboard guns. Everyone yipped in anticipation! It was a clever move, and brilliant piloting. Sadly, the shots failed to hit, and so the Blaarg, seeing they had been outmaneuvered, decided to send a boarding party to finish the job. 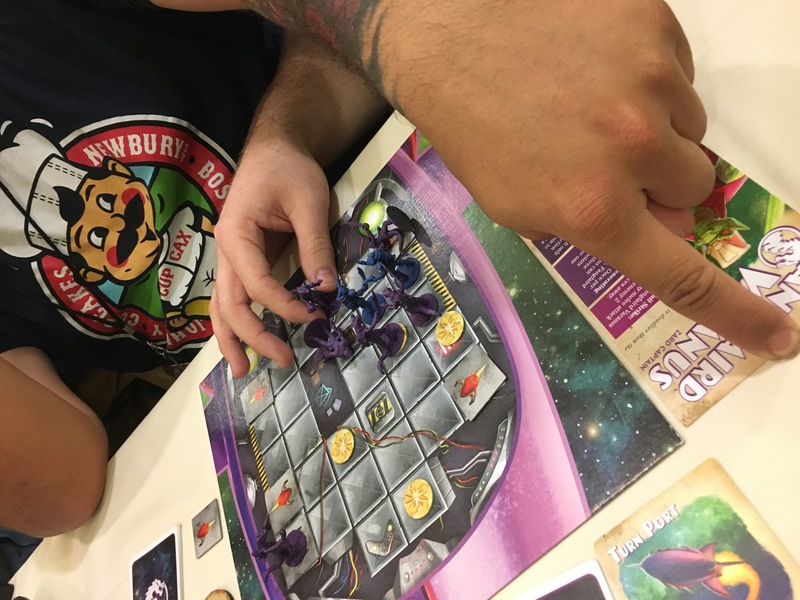 Jettisoned into space, the Blaarg Captain himself, allied with a few Blaarg minions cut through the Astro-Ranger hatch, and engaged the crew. Jesse Novastar stepped in and began a long and climactic circuit-sword duel with the Blaarg Captain. Jesse jumped high in the air, and slammed her circuit-sword down into the bulging eye of the Blaarg Captain. As the Blaarg Captain let out a gurgled scream, the Astro-Ranger crew cheered. The Blaarg minions fled, and the Astro-Rangers won the day. Finally… we had a spotting of a pew-pew of doom! I told you all in the video! It is nearly IMPOSSIBLE for anyone NOT to say ‘pew-pew’ while playing Rayguns and Rocketships! We are less than $1,300 away from funding and unlocking amazing stretch goals! Tell a friend, grab a raygun, and hit the stars! ← IDW Games Wages War Against the Blaarg!